Falling production, rising debt and reduced reserve life were among the chief issues facing Pemex, Mexico’s national oil company. Historic reforms were introduced by Mexico’s government in 2013 to try and spark a significant reversal in performance of both Pemex and the country’s hydrocarbon production as a whole. Aside from reducing the company’s heavy tax burden and pension liabilities, the reforms allow Pemex to pursue outside investment via joint ventures and to join consortiums bidding for new acreage. Full details on the reforms are available in the report, which can be downloaded here. Pemex has sought partners to create joint ventures on key development opportunities that previously it could not tackle alone. Encouragingly, it has now agreed to three deals worth a combined $1.2 billion in cash, cost carries and cost reimbursements. At the end of 2016, Pemex also began participating in Mexico’s bid rounds for the first time. In the country’s first deepwater bid round (1.4), the company won one block in partnership with Chevron Corp. and Japan’s Inpex Corp. A few months later, Pemex secured two shallow water blocks, one in partnership with Colombia’s Ecopetrol and the other with Germany’s DEA Deutsche Erdoel AG, as part of the shallow water round 2.1. In early 2018, in the deepwater round 2.4 and the shallow water round 3.1, the company was awarded 11 further blocks. A handful of these were awarded to Pemex as the sole bidder while others saw Pemex win via more consortiums – providing Pemex with additional very experienced, successful and deep-pocketed international explorers as partners. The companies, along with the number of blocks Pemex will partner with them on, are listed below. Download the report at this link. 1) “Proved reserve life” is the number of years at current production levels it would take to deplete all proved reserves. Successful bid rounds in Mexico and Brazil during Q1 secured $3.1 billion in cash – a huge step forward for both countries in securing global interest in offshore development. Brazil 15th bid round in March was responsible for 79% of this value, with huge individual bids from ExxonMobil, Petrobras and Norway’s Statoil. 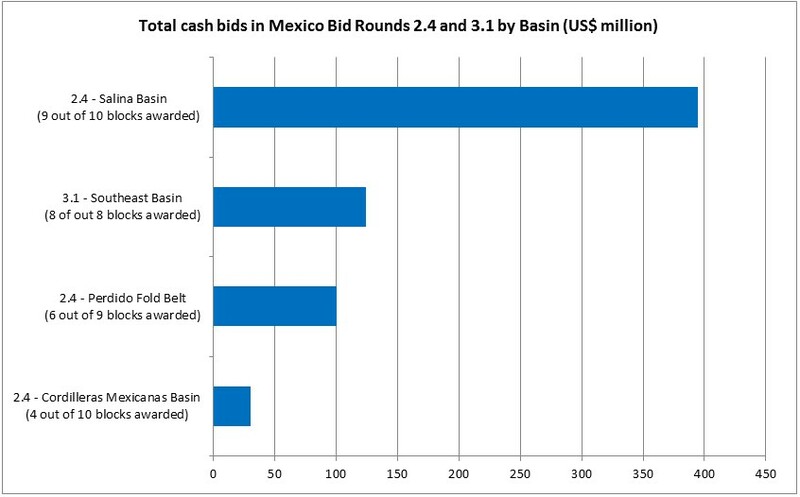 Mexico’s deepwater Round 2.4 (January) and shallow water Round 3.1 (March) drew $649 million in cash bids combined. The $525 million generated in Round 2.4 was a huge step forward from Mexico’s seven previous rounds, where only a handful of blocks drew any kind of cash bid. All eight blocks on offer in the Southeast basin drew multiple bids in Round 3.1. Block 30, eventually won by Germany’s DEA Deutsche Erdoel AG, the U.K.’s Premier Oil and Malaysia’s Sapura E&P, was the most competitive and received seven separate bids. The main goals of Mexico’s energy reforms, which were instigated in 2013 and are detailed within the report, have been to inject competition into the upstream sector. It cannot be denied that this has been achieved so far. The changes are also reshaping how Pemex, which has previously monopolised activity, operates within this altered marketplace. For sure, the company is still winning blocks ¬– four new blocks in Round 2.4, and seven new blocks in Round 3.1. But of the 11 blocks won by Pemex, nine were as part of a consortium and six were won by defeating a rival bid. Full results and analysis of the key awards in all three rounds is available in the report, which can be downloaded here. Nearly 70 companies ­have entered the fray since Mexico opened up its E&P market ­– among them Royal Dutch Shell, Petronas and Total. The inaugural bidding rounds follow key constitutional reforms enacted in 2013 to end national oil company Pemex’s 75 year monopoly and accelerate investment in its untapped onshore and offshore areas. Competition in the sector is now rife, with international companies investing heavily in offshore areas in particular. The biggest early mover is Shell. It has secured the most new blocks (11 to date) among international companies. Nine of these were awarded in Round 2.4, which was held in January 2018 and focused on deepwater areas. Shell dominated that particular round, securing four of its new blocks with solo bids, and partnering with Pemex and Qatar Petroleum on others. 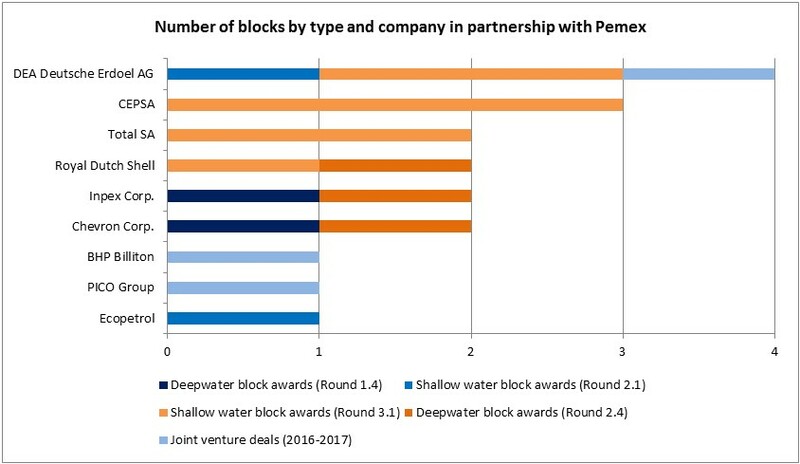 Later, in March, Shell also secured a shallow water block in Round 3.1 with Pemex. 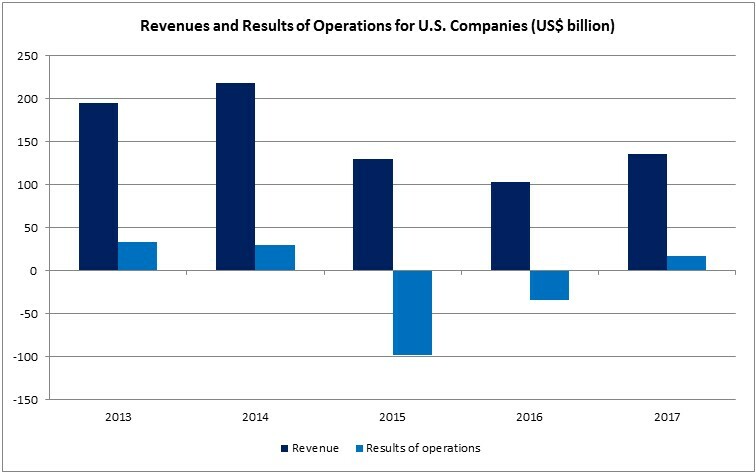 No single international company is dominant in the sector. Malaysia’s Petronas ranks just behind Shell with nine blocks and has focused on deepwater assets too. 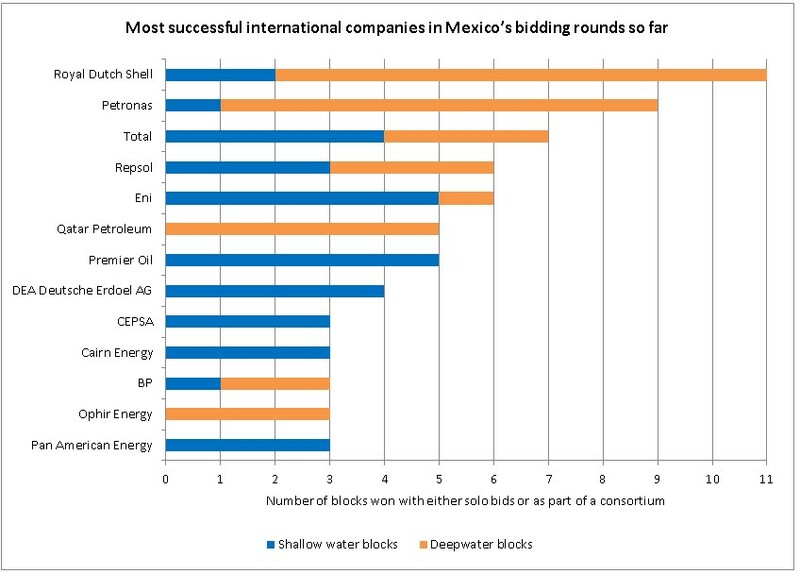 European producers Repsol and Total have collected a number of both shallow and deepwater blocks, while Italy’s Eni and the U.K.’s Premier Oil are the most active international companies in Mexico’s shallow water areas with interests in five blocks apiece. 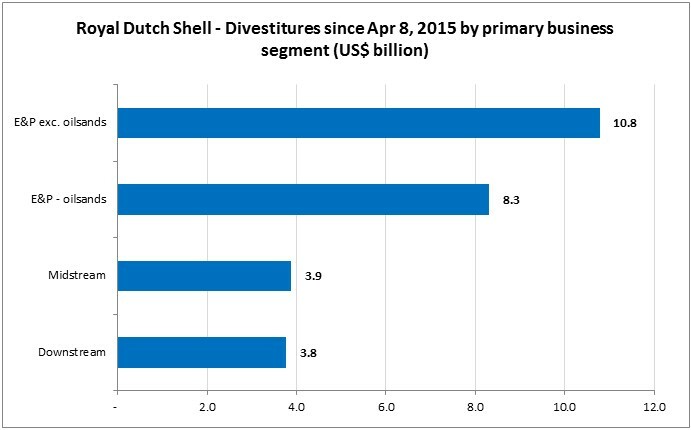 Since agreeing the largest single upstream-centric deal of the past 10 years to purchase BG Group back in April 2015, Royal Dutch Shell has been selling assets all over the world to rationalize its portfolio. Including this week’s US$750 million sale of an offshore shallow water gas field in Thailand, the company has now agreed sales of assets and business units for a grand total of just under US$27 billion between April 8, 2015 – the day the BG deal was first announced – and January 31, 2018. According to data available in Evaluate Energy’s M&A database, Shell has been involved in 48 separate asset sales since the BG announcement, five of which were agreed for a value of over US$1 billion. From the Canadian oilsands to pipelines in the U.S. and chemical businesses in Saudi Arabia, the company’s sales have taken place all over the world and in a variety of business segments. 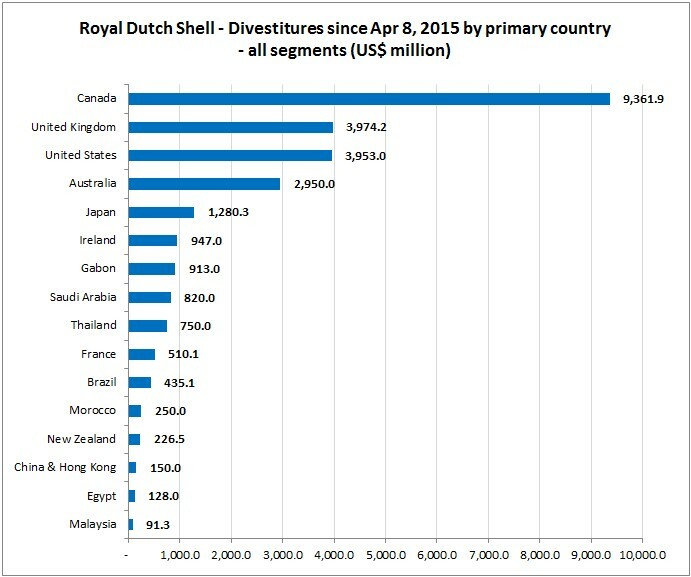 In terms of deal value, at US$9.4 billion it was Canada that saw the highest amount accumulated in asset or business unit sales by Shell since April 2015. The majority of this value revolves around the US$8.3 billion sale of a 60% stake in the Athabasca Oil Sands Project to Canadian Natural Resources in March last year. This is still the largest individual sale that Shell has made since acquiring BG. The United States, where 11 Shell sales took place, saw the highest number of individual deals agreed, ahead of the UK with eight and Canada with five. 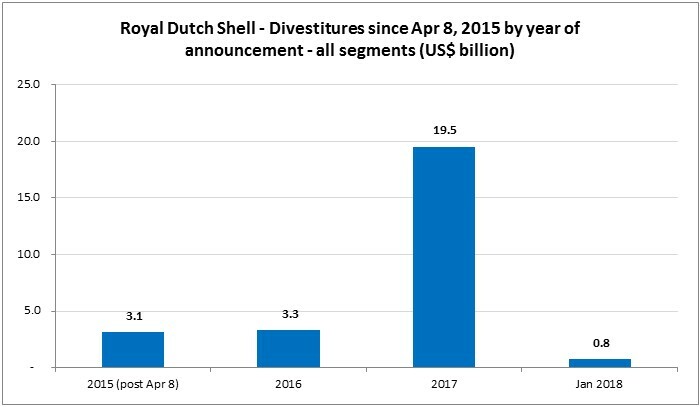 This US$27 billion is also probably just the tip of the iceberg; of the 48 individual divestitures Shell has agreed to since April 2015, the acquisition cost for 19 of them remained confidential. A number of these involved the kinds of assets that would normally change hands for sizeable sums, including the sale of stakes in an Iraqi oil field, a Chinese lubricants business and a Malaysian LNG export facility. For more on Shell’s asset divestments and indeed any acquisitions made over the past 10 years, request a demonstration of Evaluate Energy’s M&A database at this link. 1) In deals with multiple countries or segments involved, a deal was assigned to a country and a business segment according to where the majority of the value was estimated to reside. 2) Deals were assigned to a time period based on the deal announcement date. 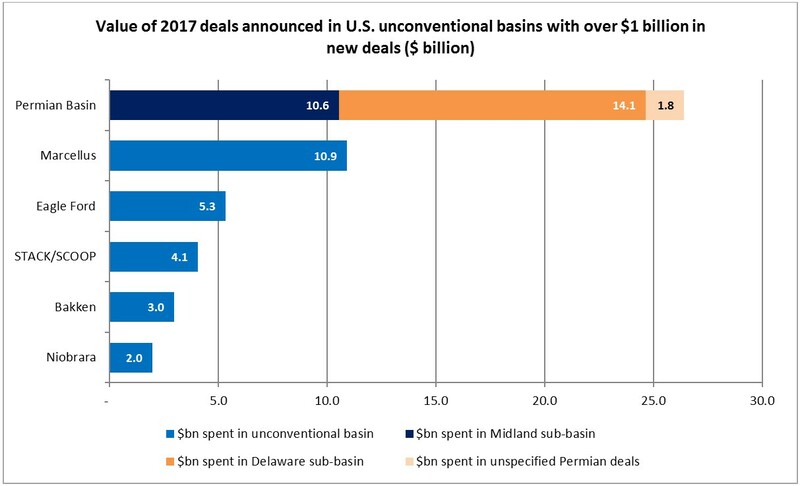 3) Deals in the midstream segment include deals for LNG, pipelines, storage, terminal assets and processing facilities. 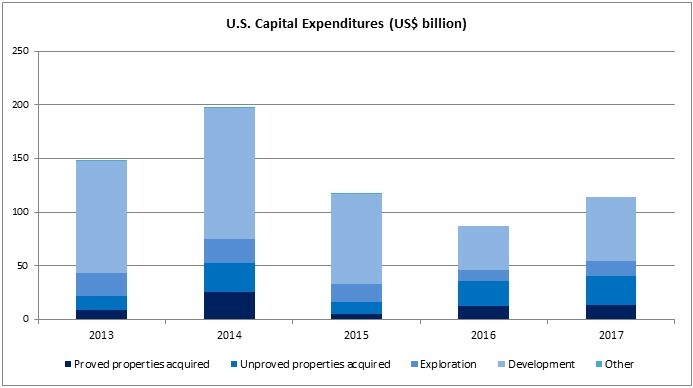 Deals in the downstream segment include deals for refineries, service stations, chemical production facilities and oil product marketing assets. Mexico’s abundant on-shore and offshore basins are now starting to attract significant independent and foreign investment. Fuelled by Mexico’s energy reforms, enacted in 2014, 2017 saw more than $800 million in upstream deals agreed by state-controlled Pemex to form joint ventures on a handful of major projects. Several successful licensing rounds were also completed. This sudden flood of activity means that only Brazil, Argentina and Colombia have seen more deals in pure dollar terms since 2014, according to a new report released in partnership by the Daily Oil Bulletin, Evaluate Energy and Sproule. Entitled Latin America: Assessing the impact of oil prices, energy reforms and national oil companies on deal activity, the report is available for download here. 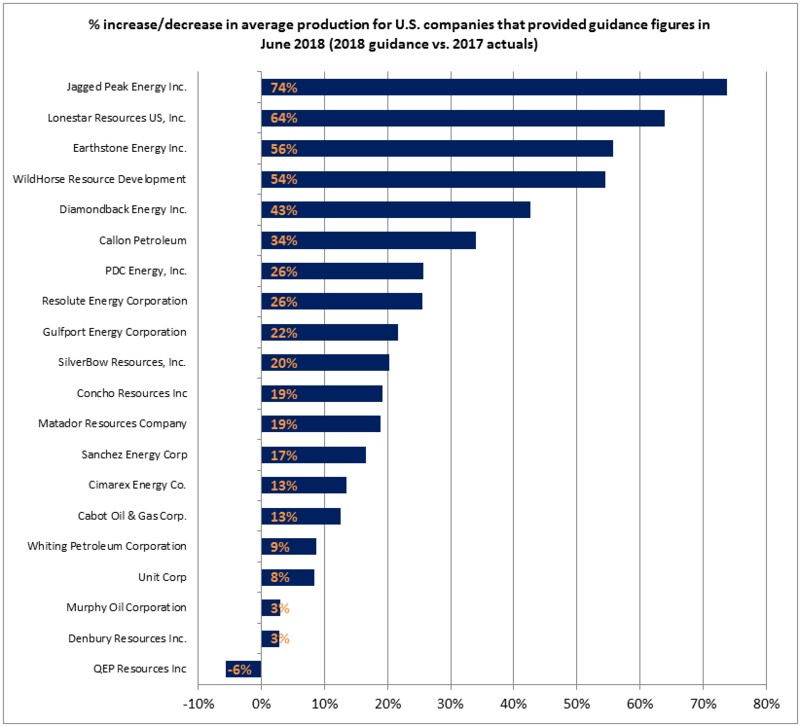 The new report shows that while Brazil and Argentina lead by far with US$12.9 billion and US$7.8 billion in upstream sector deals since the start of 2014, respectively, Mexico is suddenly only slightly behind Colombia in fourth place in the rankings over the full four-year timeframe after this busy year of deals since the end of 2016. If the momentum achieved in 2017 continues, Mexico can expect significant additional investment over the next 11 months. “Touted as having one of the best energy futures of any developing nation, Mexico has abundant untapped potential in both onshore and offshore basins, including virtually untouched unconventional resources,” said Jim Chisholm, report co-author and Vice President, Latin America, at Sproule. For more information on upstream M&A activity in Mexico, including details on the seven stages of license awards, Pemex’s US$800 million in joint arrangements and an overview of the licensing award schedule for 2018 and beyond, download the full report from the Daily Oil Bulletin, Evaluate Energy and Sproule at this link. 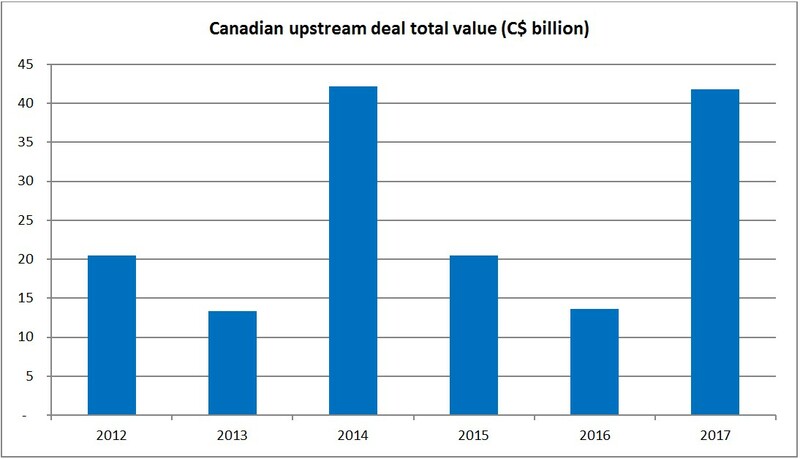 Canada’s upstream sector saw almost C$42 billion in new deals agreed in 2017 – a 91% increase over the five-year annual average – as a few massive oilsands deals offset a drop in overall deal-flow. Source: CanOils M&A Database – deals are assigned to a year based on their announcement date. 2017 saw $32 billion in spent in three major oilsands deals, which comprised more than three-quarters of the year’s outlay for Canadian upstream assets. The year ended quietly – with just C$117 million in new deals agreed in December according to data available in CanOils’ latest M&A report. There are reasons for optimism, however, heading into 2018. “2017 was a relatively stable year for the oil price and in general M&A markets around the world have responded positively,” said Wilson. A full rundown of 2017’s largest deals in Canada is available free in a new CanOils report focused on December activity. Click here to access it.